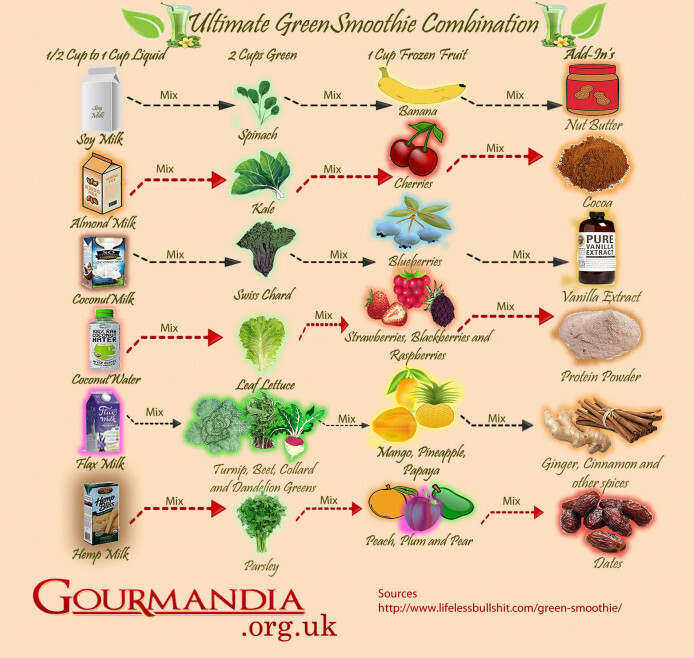 If you've jumped on the smoothie bandwagon, you may be familiar with green smoothies. Regarded as the ultimate elixir for health, green smoothies contain an abundance of vitamins and minerals from fruits and vegetables. But if you make them often, you may find yourself in a green smoothie rut. That's why we love this nifty infographic from Gourmandia. It provides endless combinations of ingredients so you won't get bored drinking the same smoothie everyday. Love kale? Blend it with almond milk, blueberries and vanilla. Is spinach your thing? Mix it with a bit of soy milk as a base, banana and nut butter. For more great smoothie ideas, check out how to make smoothies in five easy steps.